Ranveer Singh, Nick Jonas & More: The Best Dressed Celeb Grooms Of 2018! The year 2018 saw a lot of Bollywood and television celebs get married! 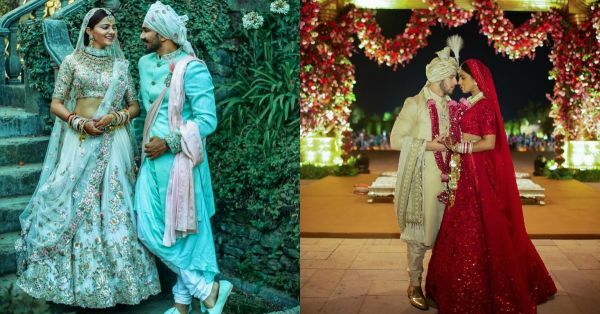 Deepika-Ranveer, Sonam-Anand and Priyanka-Nick wowed us with their larger-than-life weddings and then came the intimate wedding of Roadies fame, Raghu Ram to Natalie Di Luccio. Add to this the traditional Punjabi wedding of comedy king, Kapil Sharma to his longtime girlfriend Ginni Chatrath. While we've all had enough discussions about what the brides wore, today we're taking you through the groom looks. Here are our best-dressed celeb grooms of 2018. From donning an Anarkali kurta at his mehendi to a traditional Konkani attire at the wedding and a royal red Sabyasachi sherwani for the Sindhi traditions, the fashion icon stood out in each of the looks. Ranveer made a stunning groom for his Konkani-style wedding in an ivory and gold veshti, kurta and angavastram. For the Sindhi-style wedding too he opted for a red kanjeevaram sherwani made in brocade and enhanced with embroidery by Sabyasachi for his 'India Revival Project'. He opted for a red and gold saafa around his head. Apart from that, he also wore a layered mala of red beads and another kundan neckpiece. Ranveer completed his look with a very heavy red stole dupatta. 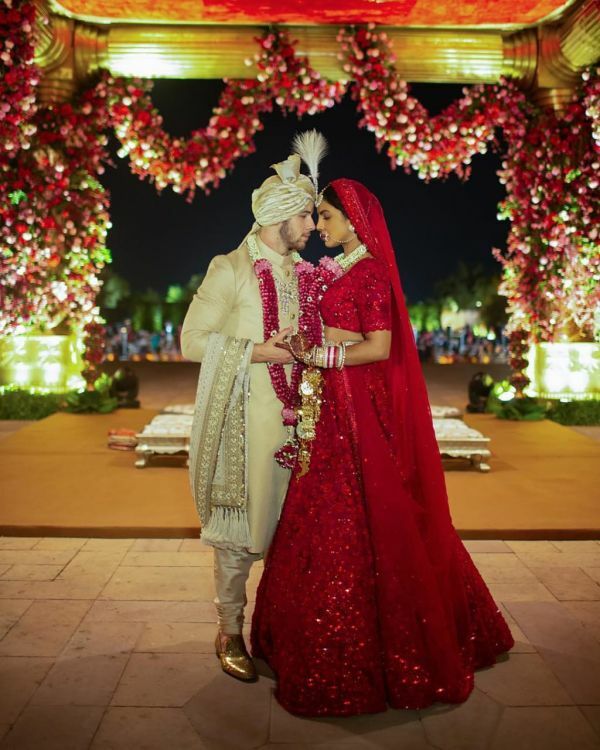 Just like Deepika Padukone and Ranveer Singh, Priyanka Chopra and Nick Jonas opted for two weddings: Indian style wedding and a white wedding. For the white wedding, Nick was dressed in a custom Ralph Lauren suit and looked dapper as he stood at the altar, with tears in his eyes as he saw Priyanka walk down the aisle. For the Indian wedding, he opted for a hand-quilted silk sherwani with a hand-embroidered chikan dupatta and a chanderi tissue saafa by Sabyasachi. His rose cut kalgi and Syndicate diamond necklace too was from Sabyasachi's Heritage Jewellery collection. When it came to nailing the fashion game, telly-town grooms were not far behind and Abhinav Shukla sure was one of our favourites. 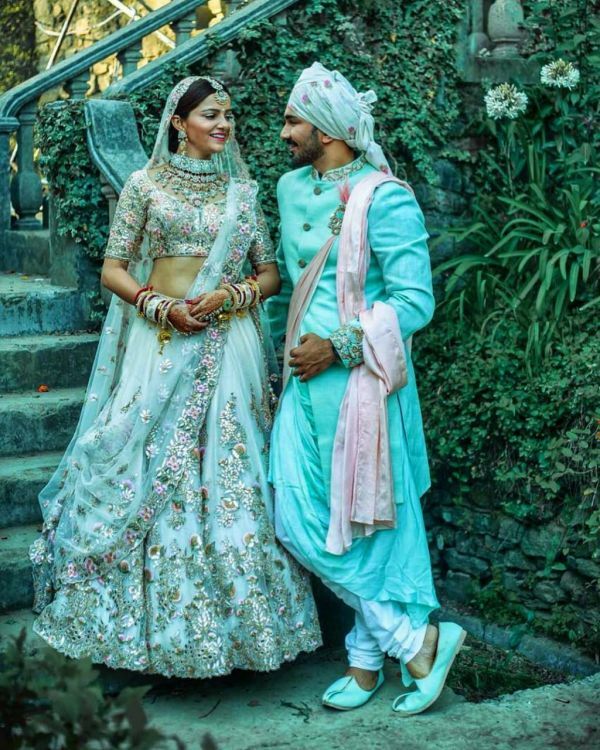 For his wedding with longtime girlfriend, Rubina Dilaik, he chose a muted mint green sherwani and pastel pink Jodhpur pants. He also opted for a beige coloured turban with floral motifs and looked just like a modern-day royal groom. Gautam Rode and Pankhuri Awasthy tied the knot in an intimate ceremony at Tijara Fort Palace in Ajmer, Rajasthan. For the wedding, Gautam opted for a gold-hued sherwani from Pawan and Pravan and wore customised matching juttis to complete his look. Nice, no? Sonam Kapoor and Anand Ahuja's wedding was definitely the most fun event we witnessed this year. And the groom, Anand Ahuja brought forward his A-game when it came to shaadi dressing. Anand opted for a Raghuvendra Rathore bandhgala complete with a beige turban and a saafa. And let's not forget that he wore sneakers with a bandhgala for his reception! Now, who else is cool enough to do that?! While Sonam dazzled in all her wedding outfits, her brother Mohit Marwah was not too far behind at his wedding to Antara Motiwala. Mohit wore a beige sherwani with a white saafa on the day of his wedding. The outfit was designed by Kunal Rawal and was accessorised with a kundan and emerald neckpiece and a string of pearls. 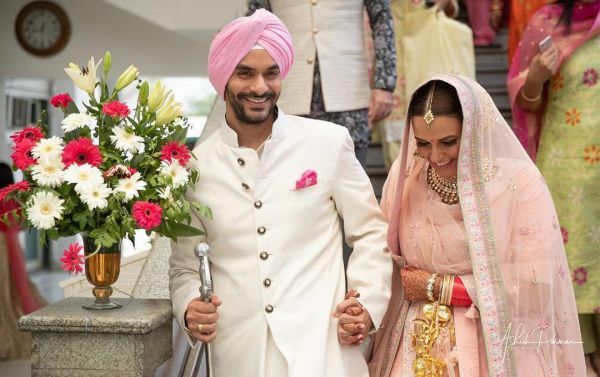 Angad Bedi's wedding to best friend Neha Dhupia was one of the most unexpected weddings that we witnessed this year! The actor looked his usual handsome self in a stark white bandhgala suit. He matched his turban and pocket square with Neha's Anita Dongre lehenga and the couple looked picture perfect.